I am part of a team of Fishery Enforcement Officers that patrols the rivers, still waters and canals in the West Midlands ensuring anglers have a fishing licence and are complying with fishing regulations. I love what I do because each day is different and since I started working as an Enforcement Officer 26 years ago I have had to deal with all sorts of offences including poaching, illegal fishing instruments; i.e. set lines, gill nets, traps and gaffes. I have also had to deal with illegal stocking of fish in still waters and the introduction of non-native species. 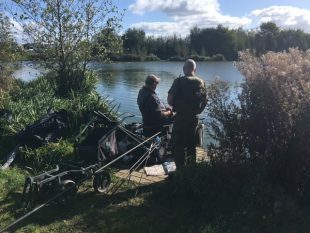 One of my main duties is to carry out fisheries enforcement work, which means, amongst other things, I check all anglers are fishing legally and have the correct licence for fishing. The money we raise from selling fishing licences is all used to improve and develop fisheries across the country . These funds are incredibly important for the work we do to improve fishing for anglers across the West Midlands. The money raised is reinvested to improve facilities for anglers, help manage predation and protect stocks from illegal fishing. We also carry out fish restocking, manage the impact of invasive species, restore and improve habitats and work with partners to encourage people to take up fishing for the first time. Enforcement work is really important to ensure fish populations are protected. Our work includes: auditing and inspecting fish movements’ patrolling rivers to check no one is fishing in the closed season; educating the public and fishery owners and looking for unlicensed and prohibited nets and lines. Throughout this year, we’ve been cracking down on people who do not buy a fishing licence and we’ve successfully prosecuted many anglers who have been operating without a licence, which has attracted some hefty fines (fines can be up to £2,500 – see our latest prosecutions at http://www.anglingtrust.net/page.asp?section=1012. Last year we checked over 9,500 licences in our Area and prosecuted more than 500 of those anglers who were fishing in the West Midlands area alone. My role requires me to cover large areas and many fisheries. My work is often intelligence led resulting in targeting specific areas where there are reports of people illegally fishing increasing the likelihood of finding people fishing illegally. As a team we also carry out boat patrols, as done recently along the rivers Severn and Avon. Recently, I have been working in partnership with local police units in the West Midlands to target fish theft by crime groups in areas known to be ‘hotspots’ for fisheries offences. Our joint patrols have proved to be incredibly effective at tackling a wide range of issues that reduce safe and accessible fishing opportunities for local communities. Patrols such as these also give us the chance to jointly gain valuable intelligence that can be used in the prevention and detection of more serious crimes. The majority of patrols go off without serious incident and in the Enforcement Team we are always looking for a compliant and safe outcome. Anyone who sees or suspects illegal fishing activity can report it to our 24 hour incident hotline on 0800 807060. If you’re thinking of going fishing, don’t forget to buy a fishing licence. It’s quick and easy and costs just £30 for a whole year just visit www.gov.uk. the EA have been sat around a table since 1978/80 talking about how to solve the problem ,,and in 2018 they are sat around the same table talking the same BS. and now we have Chinese mitten crabs that cause million pounds worth of damage each year , guess where the EA are ? yep sat around same table talking about it .